Home > Departments > Faculty > Thomas Kuehne Ph.D.
Thomas Kühne is Professor of History and the Strassler Chair in the Study of Holocaust History and the Director of the Strassler Center for Holocaust and Genocide Studies at Clark University. Currently he serves also as Director of Holocaust and Genocide Graduate Studies. Affiliated with Women’s Studies Program and Race and Ethnic Relations Program at Clark, he teaches Modern European and German History, with a focus on the Holocaust and Nazi Germany. His research explores the relation of war, genocide, and society, long-term traditions of political culture and political emotions in Europe, and the problem of locating the Holocaust and Nazi Germany in the continuities and discontinuities of the 20th century. 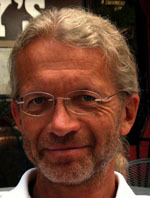 Thomas Kühne earned his Ph.D. from the University of Tübingen in 1992 and taught at the Universities of Konstanz, Tübingen and Weingarten in Germany thereafter. His initial scholarly work focused on cultural patterns of political conflicts and consensus strategies in 19th and 20th century Germany. His dissertation on electoral politics in Imperial Germany (published 1994) won the German Bundestag Research Prize. Since then, Kühne has been especially interested in synthesizing new approaches to the history of mass violence. His essay collection on the history of masculinities in modern Germany, Männergeschichte-Geschlechtergeschichte (Men’s History—Gender History, 1996) established this field in Central Europe and stimulated a broad range of innovative gender studies. From 1998 to 2001 he served as chair of the German Historical Peace Research Association and engaged in the new cultural military history (Was ist Militärgeschichte, What is Military History, 2000, co-edited with Bejamin Ziemann). Awarded major grants from the German Research Foundation, he completed his habilitation thesis at the University of Bielefeld in 2003. Accepting an invitation from the Institute of Advanced Study in Princeton, New Jersey, he came to the United States in 2003. He has been at Clark since 2004. In 2010, he was awarded a fellowship from the John Simon Guggenheim Memorial Foundation and spent another year as fellow at the Institute for Advanced Study in Princeton. Kühne’s recent studies explore the emotional and moral frameworks of collective violence. His 2006 book Kameradschaft suggests that the myth of comradeship, born in the First World War, shaped the experiences and actions of German WWII soldiers as well as war memory after 1945. Comradeship combined male bonding through criminal means with in-group “humanity.” It established a moral reference system that abandoned the idea of individual responsibility and enabled soldiers to support and to carry out the Holocaust. Scrutinizing the entire Nazi society, Kühne’s new book Belonging and Genocide. Hitler’s Community, 1918-1945 (Yale University Press 2010) explores how the Germans switched to community-based violent ethics even before the Nazis came to power, and how the Nazis used the human desire for community to build a genocidal society. It argues that the German nation eventually found itself through committing the Holocaust. Kühne’s edited or co-edited volumes include The Holocaust and Local History (2011, with Tom Lawson); Massenhaftes Töten. Kriege und Genozide im 20. Jahrhundert (Mass Killing. Wars and Genocides in the 20th Century, 2004, with Peter Gleichmann); Von der Kriegskultur zur Friedenskultur? Zum Mentalitätswandel in Deutschland seit 1945 (War Culture into Peace Culture? Changing German Mentalities since 1945, 2000). A volume on Globalizing Beauty. Body Aesthetics in the 20th Century, co-edited with Hartmut Berghoff, is to appear in 2013.